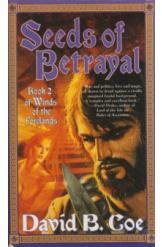 Seeds of Betrayal, Book 2 of Winds of the Forelands by David B. Coe Sci Fi. Book in a very good condition, all pages intact. The Forelands peace of 900 years has been disturbed and there is the threat of war since the murder of Lady Brienne. There are also whispers of a new Qirsi threat. Who wields magic that is potent enough to stop him?